It’s May–harvest time. Months ago I planted carrots, garlic, potatoes, peas, fava beans. Now it’s time to pull them out and cover up the beds for the fallow season. I know it’s weird–just as everyone is planting out their tomato starts and cuc seeds for a summer garden explosion, I’m reining her in. Believe me, I wish I could have a big summer garden. But I’ve taken over paying the water bill now–and it’s huge. How did a renter get stuck with the water bill? My landlord for our apartment, which also has the hose bib I use to water the garden, has gone missing in action, and EBMUD turned off our water. I turned it back on and put the bill in my name. So far, every two months the garden uses about $75 worth of water–a lot, especially when it’s been raining and I haven’t had to water much. Imagine the July bill! So, just like last year, I’m going to give the garden a summer break. Yesterday, I harvested all the fava beans. 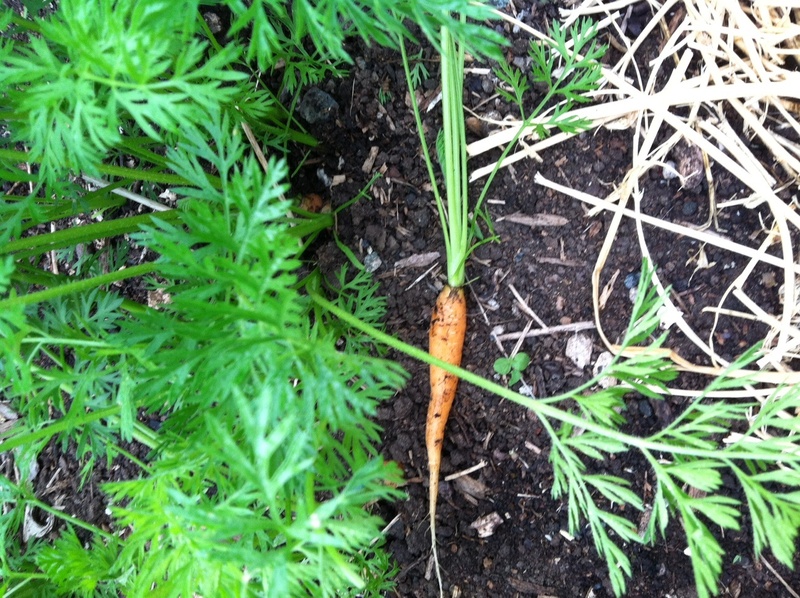 And I just started pulling up the first of the carrots. By June, when the rains have ceased, I’ll harvest the rest of the carrots, the potatoes, let the garlic dry up and then yank it. By July the only thing I’ll need to water are the fruit trees. 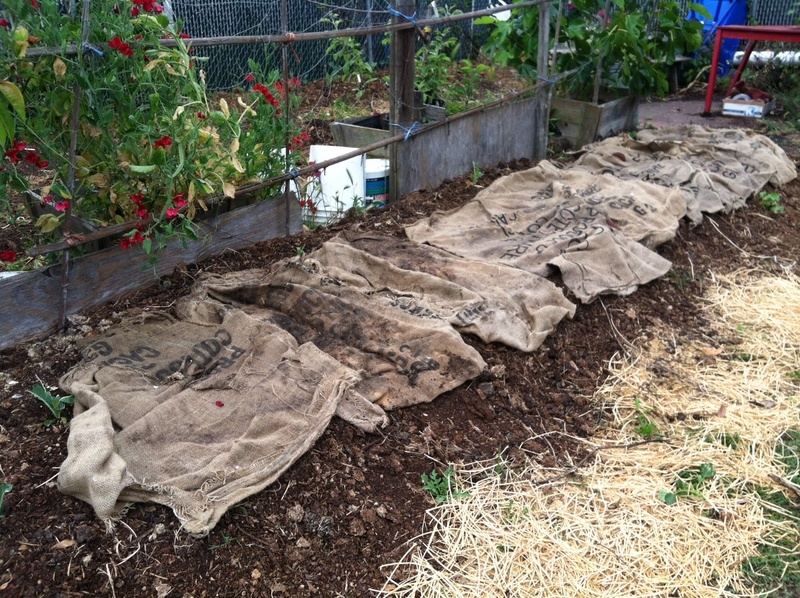 I’ll cover everything with mulch or burlap bags. I am dry farming a few early girl tomatoes and some russet potatoes. By the duck drinking area, I’ll probably pop in one cucumber plant which will drink up all that spilt water. I’ll be going to the farmer’s market for everything else–glad to support them, while I take a wee break and try to finish my next book…. I’ve been purchasing ollas for my raised beds. The do well esp. here in droughtful Austin, Texas. Those beds without ollas —- I sink milk cartons with a few holes punched in them. Aw, Novella, I wish I could run the hose across the street and around the corner from the French bakery to you! You could have all the free water you want! Do you have any space or ability to put in rain barrels? You can set up tarp barrels if you’re worried about the runoff from your roof. You need rain harvesting system, and check out dry gardening. Steve Solomon of Territorial Seed fame (he started it, sold it, and has written a bunch of veg gardening books) has it all figured out where you put the water hog veg (like lettuce) in one bed and then everything else gets spaced out so they’re not competing for water with each other. He’s got good ideas. But maybe you just want to take the summer off and enjoy your new baby. And write your book. Sounds like a plan. Enjoy Francis while she is still in the snuggly warm milk smelling phase. Supporting local farmers is almost as good as growing your own. Summer time….. and the living is easy! New book? Oh good!!! I loved your first one and have read it 3 times. Will look forward to the next one. Enjoy your summer. I’m so excited that you are writing another book. I can’t wait to read it! I second Paula’s advice about reading Steve Solomon. I read his book “Gardening When it Counts”. Great ideas for gardening with much less water (I’ve not tried the ideas, but some of them make a lot of sense). Summer gardening in CA is overrated anyway. It’s just too damn hot and water-thirsty out there. I’m with Sheila Z. Family is a brand new adventure. There’s nothing more punk rock and nothing more dismissed than motherhood. You let you garden rest and we’ll read your books. See you when Francis is ~8 months old! I appreciate that you can see the writing on the wall & that you need to par down to do all this right. Perhaps some of your fans can bring you produce from their own adventures… I’d be happy to deliver. 🙂 We glean from fruit trees in Vallejo and build community-wide gardens. Good luck with little Francis! Just finished our town library’s copy of “Farm City” and am running out to buy my own copy tomorrow. I loved it and am VERY happy you are writing another one. Am also very happy to find this blog. Keep up the amazing work! Maybe you could have an apprentice and pay them in veggies? Hi you have been nominated for a leibster award congratulations. I’m an eighth grader who loves to write and garden. My friends always tease me because I read a lot of garden books in class. I read your book Farm City last month and really liked it. We have our own urban farm in Berkeley with four chickens. It’s too bad about your garden this year, but I understand that water can be expensive. I know you’re busy with your new baby and all but I would love it if you checked out our blog. The URL is http://thetomatoboys.wordpress.com. P.S. My English teacher read your book too. She said that they tried to get you to speak at Head-Royce but you wouldn’t because you don’t like to speak to privileged kids much. I though that was pretty funny. Loving your book, and the blog. I’m in Louisiana, where water usually comes in the form of brief afternoon showers that just seem to raise the humidity, unless a hurricane is coming, in which case we get a deluge. I found a rain barrel on sale recently and snapped it up, in case we have another drought like the one in summer 2011 – maybe that would also work for you. I’ve seen plans in Mother Earth News magazine for July on how to use a rain barrel to “divert” the water directly to the garden through hoses, to make things easier. Keep writing – love to read what you have going on.